By Carl NolteThe National Park Service does not usually approve of graffiti. "It's a federal offense," said Marcus Koenen, site supervisor for Alcatraz, the former prison that is now part of a national park. However, the government has made an exception for graffiti left behind during the Indian occupation of the island--and it helped restore signs painted by hand on a landmark water tower. 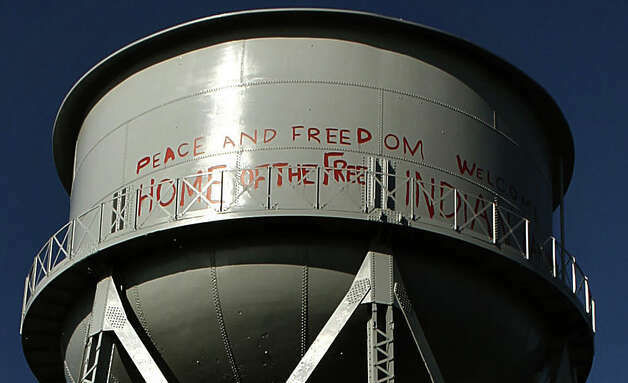 "PEACE AND FREEDOM WELCOME HOME OF THE FREE INDIAN LAND," the writing says in red letters 4 and 5 feet high. "We restored it because it has a social significance," Koenen said recently. "It is part of what this park is all about. "Comment: For more on Alcatraz, see Review of Contrary Warrior and Indian Cultural Center at Alcatraz. A new "Newspaper Rock" indeed.